Atlanta Police have announced the arrest of a suspect in the multistate serial stabber case. The suspect was attempting to board a flight to Israel, apparently on an expired Israeli passport. No word yet on the identification of the suspect, but police have said the man had ties to both the Flint, Michigan and Leesburg, Virginia areas. A serial stabber, apparently attacking black men has stabbed 20 people, 5 of whom have died, since May. Police in Leesburg, Virginia, and Genesee County, Michigan, suspect three recent attacks in Leesburg are linked to the stabbing deaths of five people and injuries to 10 others in the Flint area. Genesee County prosecutor David Leyton confirmed in a news conference Monday that Michigan authorities have been in contact with police in Virginia, saying “there are some similarities” between the assaults in both states. Leyton said the Virginia victims’ description of the suspect as well as their description of the suspect’s vehicle led authorities to make the possible connection. Elsewhere, police in Toledo, Ohio, said Monday that a stabbing there fits the pattern of the Michigan attacks and could be linked to the same suspect as well. The suspect is described by Michigan authorities as a white man in his late 20s to early 30s. All of the Michigan victims but one are black, leading authorities to consider a possible racial motive. Two of the three Virginia attacks involved black victims as well, Leyton said. Leesburg police told CNN they have established a $5,000 reward for anyone providing information that leads to an arrest and conviction in the case. The FBI is assisting in the investigation, Leesburg and Genesee County officials said. The Michigan attacks began May 24. The most recent was August 2. Previously, only 13 stabbings were believed related in the Flint area. “We now believe there are 15 stabbings potentially attributed to the same suspect,” Leyton announced Monday. The three attacks in Leesburg occurred August 3, 5 and 6. The stabbing in Ohio occurred August 7, according to Sgt. Bill Wauford of the Toledo Police Department. Officials in Michigan say the attacker is believed to be driving a Chevy Blazer or GMC Jimmy, model years 1995-2005, with a two-tone green top over a beige or gold bottom. Virginia authorities provided a similar description: an older model 1995-2000 Chevy S-10 Blazer with a dark green upper and a lighter tan or beige color on the lower panels. 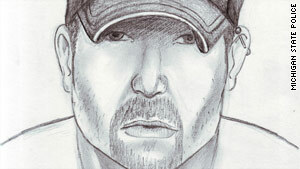 The suspect is described as a stocky, unshaven white man usually wearing a baseball cap.